We welcome inquiries from people around the world who wish to join our Kidz 4 Tzedakah project as Global Affiliates, and mirror what we are doing in Australia. There are no costs involved in joining, and we will provide you with everything necessary to get your own project started anywhere in the world. 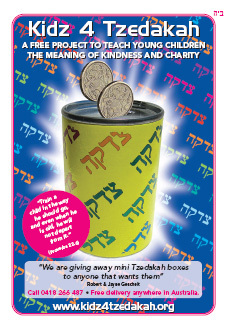 Your only expense will be the printing of small flyers (you can copy ours - pictured below) and special stickers for the boxes, and the purchase and donation of the mini Tzedakah boxes. We have a source in the USA that can supply them for about 80c each. If you are able to obtain them at a cheaper rate please let us know. Your contact details will appear on our website, and you can undertake a marketing program at your own pace. 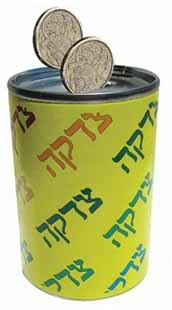 Our only prerequisite in becoming a Global Affiliate is that under no circumstances should the Tzedakah boxes be sold.